The Robert Bateman Centre is located on the second floor of the former Steamship Terminal in Victoria’s inner harbour. The Centre displays 111 original paintings and several limited edition prints by the famous wildlife painter and conservationist. Opened in May 2013, on Bateman’s 83rd birthday, the venue hosts visitors from around the world. Outreach to local communities furthers the Centre’s mandate to educate children and adults about environmental issues. A joint project is now underway between Class 7-8 at Sunrise Waldorf School (SWS) in Duncan and the Robert Bateman Centre. A collection of student artworks will exhibit at the Centre May 1-31, 2014. Two weeks ago Robert Bateman was in Ottawa, dining with dignitaries and delivering a keynote speech to the Royal Canadian National Geographic Society. He received a Gold Medal from the society on Nov 13 for a lifetime of work raising awareness of Canadian geography. Today, he is spending his lunch hour touring Class 7-8 students from Sunrise Waldorf School around the Centre. A lively and informative tour guide, Bateman delivers his messages with interesting anecdotes and personal stories. Cheryl Galloway, Administrative Assistant at Sunrise Waldorf School (far left) believes the Centre and SWS share similar ideals. “Our learning is arts-based and our curriculum embraces nature through outdoor play and practical activities,” she says. The interference of technology such as TV, media and hand-held devices in the natural development of a child, is a concern for Waldorf educators. “I can see you look closely at things,” says Bateman, admiring his thank you card from the students. He shared his favourite quote by Georgia O’Keeffe: “Nobody sees a flower – really – it is so small it takes time – we haven’t time – and to see takes time, like to have a friend takes time”. During a year long sabbatical in Germany, Bateman’s two sons (then 8 and 11) attended a Waldorf School near Lake Bavaria. Two of Executive Director Paul Gilbert’s children received a Waldorf education in Toronto. Christina Price, Class 7-8 teacher at Sunrise Waldorf School with “Gatekeeper” by Robert Bateman. Waldorf teachers move through each grade with the same children, teaching a new curriculum each year. Class 7-8 teacher Christina Price (left) has taught many of these children for eight years. “Art helps us see the world,” says Price, “to behold the world by becoming one with it through careful observation.” Price is fascinated by the play of light and dark on the metallic gate. In some areas the light rests smoothly, she notes, while in others it alights as gently as a tickle. Visual interest is added by the spiral shapes flanking a vertical twist. Price points out the touching contrast of a tender throbbing bird on a hard metal fence. Galloway finds the sense of movement exhilarating. “The rising up and spreading of the wings suggests the energetic motion of an updraft”, she says. The light-filled mist adds to the sense of wonderment of the ascending birds. Having spent time in Bali, Cheryl appreciates seeing the local vegetation mixed with the egret imagery. Grade eight student Rowan Lironi is interested in Coyote in Winter Sage. The coyote is looking off into the distance, notes Rowan, and is aware of something, looking thoughtful. Rowan likes the wintry feeling of the snow and rocky ground and the details shown in the dry grasses and sage plants. “The brittle grasses look stiff and easy to snap off,” he says. Sophia points out the dark and light shading that gives texture to the shaggy coat of the bison. She notices all the details in the curved horns and muzzle of the beast. Erin Harris, a grade seven student at Sunrise, enjoys TEMBO. The mighty elephant emerging from the mist reminds Erin of her time in Africa. During a two month holiday the family visited several game parks and rode on elephants in Zimbabwe. Erin enjoys the subtlety of shading in the artwork. She sees many different colours, and notes how the misty background helps to accent details in the textured hide. 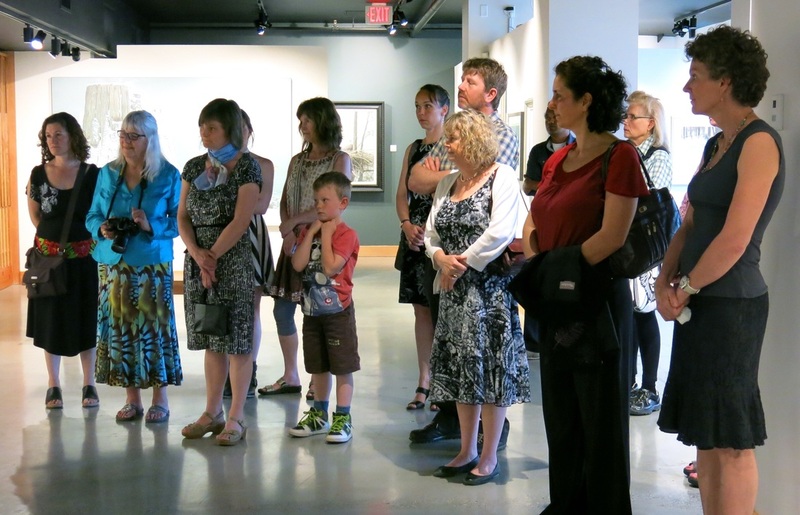 Below are photos from the opening on May 1 at the Robert Bateman Centre. 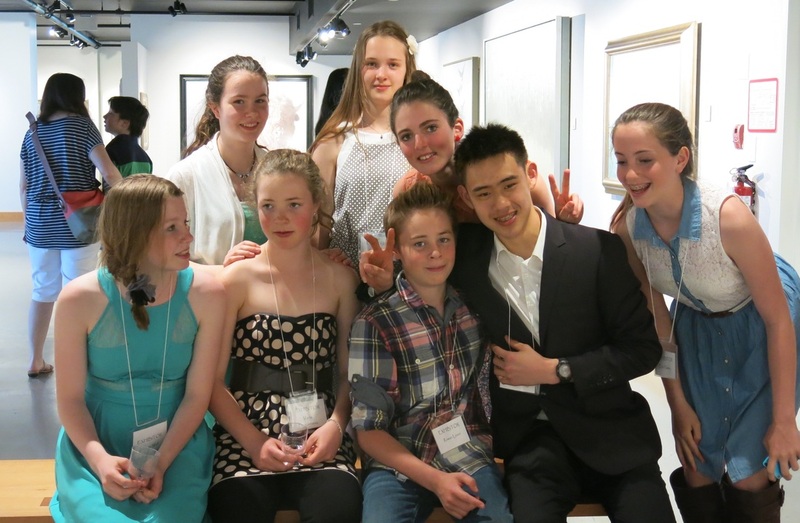 The exhibition of Class 7-8 artworks from Sunrise Waldorf School continues until May 31, 2014. Public viewing in entrance lobby is free of charge. On May 24-25 the Centre offers free admission to celebrate their first anniversaray. Kimberly Bitensky, Gallery Coordinator (facing camera) and Jesse Campbell, Assistant Curator (facing away) welcome students at the opening. Rowan Lironi with his drawing "Wolf Stalking Prey". Kevin McDuff, Head of School, thanks staff and students at the opening. Lee Herrin, President of the Board of Directors is pleased with the collaborative nature of the event. Student artists at the convivial May 1 event. Guests included Sharon Tillie (2nd from left) Vice-Chair of the Board, teachers and staff. She has a History in Art degree and Public Relations certificate from the University of Victoria. For ten years, Kate operated an art & framing shop. Community members and local businesses able to assist Sunrise Waldorf School in the costs of mounting this framed exhibition will be acknowledged and greatly appreciated. Just Jake’s restaurant in Duncan, a local supporter of the arts, will exhibit the collection June 8-27, 2014. SWS is delighted to participate with the Robert Bateman Centre on this innovative project.